Earlier this week I was in the Hurco booth at the Amerimold show in Rosemont Illinois. During the show, one of the sales managers wanted to show a customer our Cycle Interrupt mode – which allows the operator to interrupt the machine, jog the table, inspect the part, clean out a hole, etc…a scenario that is very similar to recovery restart, except with Cycle Interrupt you never actually exit the “auto” mode. So he proceeded to press the yellow Interrupt button on the control panel – which caused the Z-axis to retract to its home position and the spindle to stop - he jogged the X and Y axes out of their current position, and removed the HSK toolholder from the spindle…just to show that we could in-fact do all of those things. Once he clamped the tool back into the spindle, he could simply hit the Auto button on the control panel, followed by the Cycle Start button, and the machine would automatically reposition the X&Y axes, turn the spindle back on, drop the Z axis into position, and then resume the program exactly where it was interrupted…except this time he clamped the tool in the spindle BACKWARDS. To recover from the situation above is simple enough, but we would have to enter into Manual mode…which would cause us to exit the current Auto mode necessary for the prescribed recovery of Cycle Interrupt. Nonetheless, we quickly recovered the machine from the mis-oriented tool and where ready to restart the program. However, in the confusion of the situation the manual button had been depressed too quickly, and nobody noted the current block in the program – a VERY large mold program I might add, that had been running for several hours. Uh-oh! The experienced NC Hurco users that are reading this post are no doubt shaking their heads right now – because they are aware that you NEVER stop the machine in a situation like ours without making note of the current program position if at all possible...at least that USED to be true! 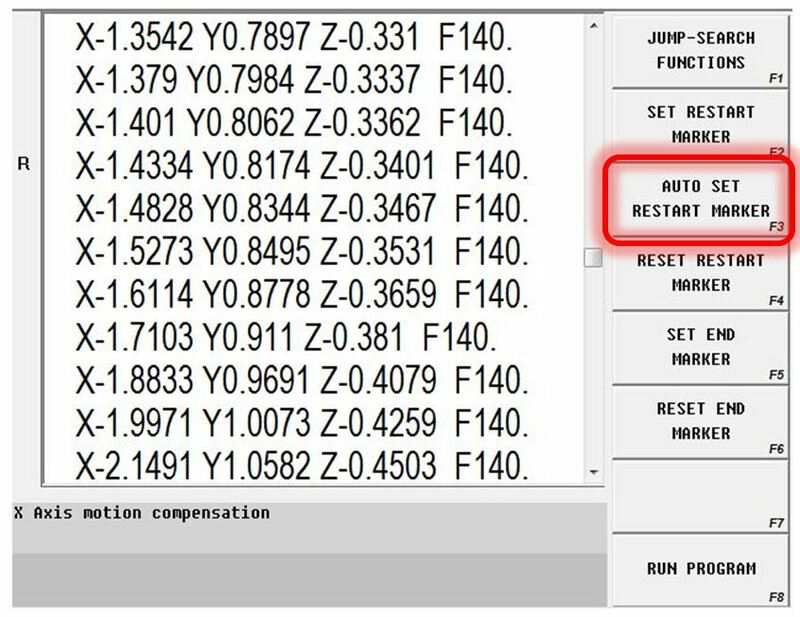 With the new feature all we had to do was enter into the Recovery Restart screen, and press the AUTO RESET RESTART MARKER softkey, and the marker was automatically inserted into the correct position for restart, and we were ready to run.